The Canadian Fallen Firefighters Foundation’s (CFFF) first major goal was the construction of the Canadian Firefighters Memorial (CFM) in the nation’s capital, Ottawa. On Sunday September 9, 2012 that goal was reached! The journey began in 2003 with the proposal to federal government to erect a national monument in the capital to honour all firefighters who have died in the line of duty including wildland, full-time, part-time, volunteer, military, airport and industrial. The National Capital Commission (NCC), which is responsible for major commemorations in the nation’s capital but does not fund them, accepted the proposal in March 2005 and allocated land for the CFM in the LeBreton Flats area of Ottawa close to the new War Museum, just to the west of Parliament Hill. Three months after NCC allocated the land, on June 10, 2005, the Foundation lobbied successfully to introduce private members Bill Motion 153 to “(a) recognize all firefighters who have fallen in the line of duty in Canada; (b) support the proposed CFFF mandate for the construction of a monument in the parliamentary precinct containing the names of all Canadian firefighters who have died in the line of duty; and (c) send a message to the Senate acquainting the Upper House of the decision of this house.” In October 2005, the project received government endorsement when the Minister of Canadian Heritage announced the site in the House of Commons. The Foundation continued to fundraise over $1.5 million over the next few years but was still short of the amount needed. In September 2009, years of further fundraising and lobbying came to fruition with the approval of $2.4 million in funding announced by the Minister of Heritage, James Moore. A national design competition, coordinated by the CFFF in conjunction with the NCC, was launched in January 2010 and on September 9, 2010 the Foundation announced the winning design - “We Were There” by the team of Vancouver artist Douglas Coupland and landscape architect Mary Tremain of PLANT Architects in Toronto. Foundation Director Cary Taylor points to his father’s name on the scale model of the CFM name wall as winning architect Mary Tremain looks on. The artists even included all the current names from the CFFF LODD list on the scale model. Following a 2-stage procurement process, including a Request for Qualifications and then Tender for General Contractor Services, the Canadian Fallen Firefighters Foundation selected Prestige Design and Construction to implement the PLANT/Coupland memorial design. 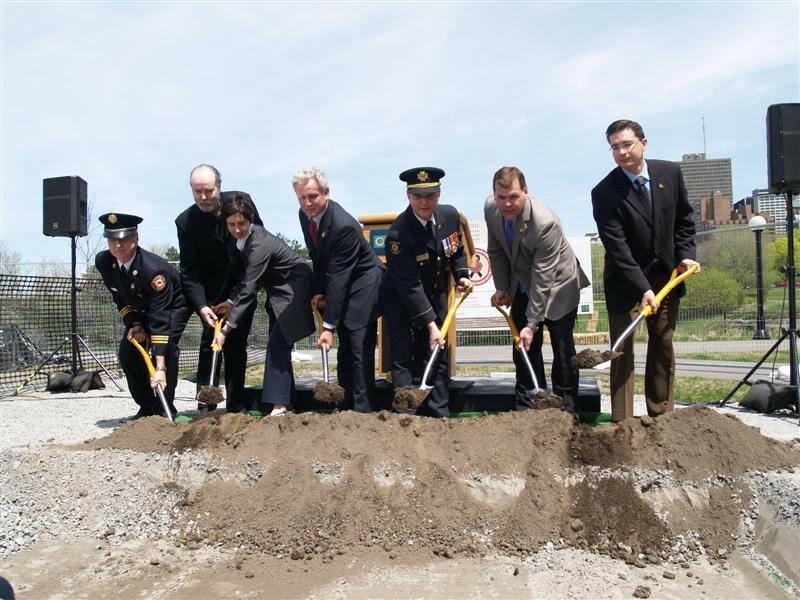 On May 12, 2011, under a sunny sky, representatives of the Canadian government, National Capital Commission, CFFF, local and distant firefighters, and citizens, gathered at the site to witness the symbolic groundbreaking ceremony for the new memorial. Immediately after, construction began on our national memorial to the fallen. Concrete foundations and site services were implemented followed by installation of the Picasso granite from Quebec for the memorial name wall and Elite Blue granite from Ontario in other areas. The bases for both the Lone Pine and the firefighter statue and fire pole were completed before winter set in and ready to receive the pine tree and bronze elements the following year. To see photos of the Groundbreaking Ceremony click here. Download the press release click here. In photo left to right; CFFF Chaplain Bruce Rushton; Artist Doug Coupland; Architect Mary Tremain; NCC Executive Vice President of Operations Jean-François Trépanier; CFFF President Robert Kirkpatrick; Leader of the Government in the House of Commons, the Honourable John Baird; MP for Nepean Carleton Pierre Poilievre. 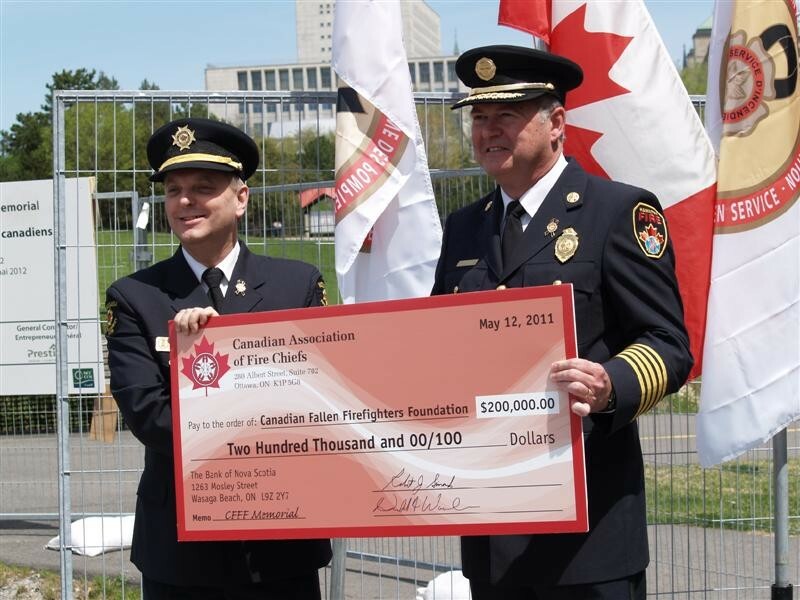 During the brief ceremony, the President of the CAFC, Hamilton Fire Chief Rob Simonds, presented the Foundation with a cheque for $200,000 towards the Memorial. In the spring of 2012 the memorial name wall and other granite was installed along with the planting of the Lone Pine tree. In June 2012, the completed bronze statue made the journey by truck from Red Deer to Ottawa to its final spot of vigilance overlooking the wall of honour which received 1111 engraved names. Plantings, walkways, and lighting final touches continued in July and August with the fire pole arriving from Edmonton in late August 2012. All was now ready for the dedication ceremony. The design “We Were There” includes a large bronze statue of a firefighter who has returned to earth from heaven via a sixty-foot high fire pole to point out the names of his fallen comrades on a memorial wall. The memorial wall, in the abstract shape of Canada, contains the names of all fallen firefighters in cloud like formations over the province near where they died. A lone pine tree, planted in a significant spot in the memorial site, represents the lone Canadian and the Canadian forests protected from fire by the bronze firefighter and the large fire pole which also acts as a lightning rod. The Foundation’s motto, “Never to be Forgotten”, is engraved on the pine tree rock. The site contains unique materials which symbolize Canada. Plantings, which turn red in the fall, represent the retardant dropped by air crews who fight devastating forest fires in western Canada. Brass couplings collected from fire departments across Canada are included in the bronze elements of the memorial making it truly national. Mobile access to the Internet at the site will enable visitors to quickly locate names on the 105 foot memorial wall through the CFFF website containing the national LODD database. Although the name wall is not directly lit, automatic lighting at night makes the site quite dramatic. The project could not have been completed without the help of so many people. Much gratitude is owed to the Foundation’s Memorial Committee led by President and Chairman Robert Kirkpatrick, along with former Treasurer Doug Lock who passed away before completion, 2nd Vice President Mike McKenna, current Treasurer John Clare, and our public art consultant Karen Mills who has been with us from the beginning. The Foundation would like to thank the staff of Heritage Canada, Janet McGowan and the staff of the National Capital Commission, GB Associates Graham Bird and project manager Tracey Shipman, artist Doug Coupland, David Weir, Architect Mary Tremain, Vanessa Eickhoff and the staff from Plant Architects, John Mazzarello and Foreman Fern Pantalone and the staff of Prestige Construction, and all the sub-contractors made sure the final product was worthy of a national memorial. The total cost for the project including construction and management was close to $5 Million and remained on budget. On September 9, 2012 his Excellency the Right Honourable David Johnston, the Governor General of Canada, dedicated the new memorial when he placed the helmet representing all fallen firefighters in front of the “Never to be Forgotten” dedication wall containing the Lone Pine. With the site then open, the 9th annual memorial ceremony began. The Canadian Firefighters Memorial is now open 365 days a year, 24 hours a day for all to visit in the nation’s capital. No matter when visiting, it captures the significance of the sacrifices made by the Canadian Fire Service in a uniquely Canadian setting to remember those who have given their lives for communities across Canada. The Foundation has created a video documentary chronicling the building of the new memorial. Copies may be purchased through the Foundation. The National Capital Commission, which is responsible for major commemorations in the nation’s capital, allocated land for the CFM in the LeBreton Flats area of Ottawa close to the new War Museum, just to the west of Parliament Hill. This area is significant in the fire history of our nation’s capitol as it is the area where the Ottawa-Hull conflagration of 1900 crossed over from Hull on the morning of April 26, 1900 after destroying 1300 buildings. On the Ottawa side of the river the fire razed 1400 buildings and killed seven. At the end of the day the fire was stopped from spreading downtown near the exact spot the monument will be located. The monument will also be located close to the spot where Captain John Lowry of the Ottawa Fire Department was killed in the line of duty on August 12, 1896 on Booth St. In 1962 the National Capitol Commission expropriated the LeBreton Flats area land but plans for its use went undecided for years. Until the new War Museum was built in 2004 the area remained virtually vacant. Soil, contaminated from years of heavy industry, has recently been removed clearing the way for new development. The N.C.C. now has plans underway to revitalize the area and include housing, parkland, cultural institutions, open areas for festivals and monuments including - The Canadian Firefighters Memorial. The CFFF is a registered charity and operates by fundraising.